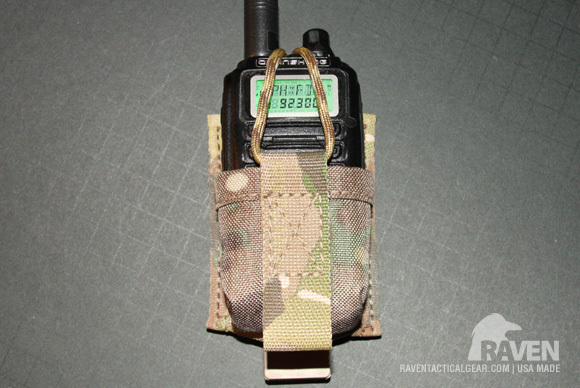 The USN Gen2 was the result of a special project with USN NSW. 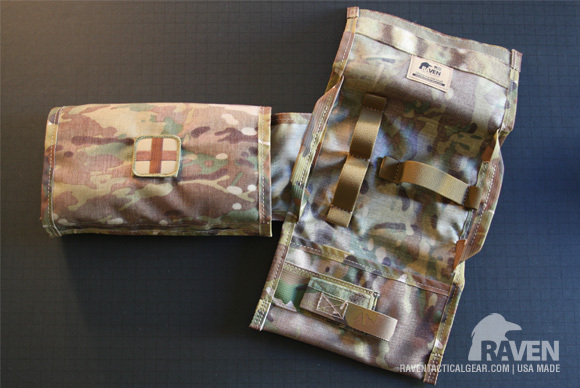 It's designed around specific medical supplies (a best of breed approach) that were identified as part of the project with the design goal of creating the smallest possible package. 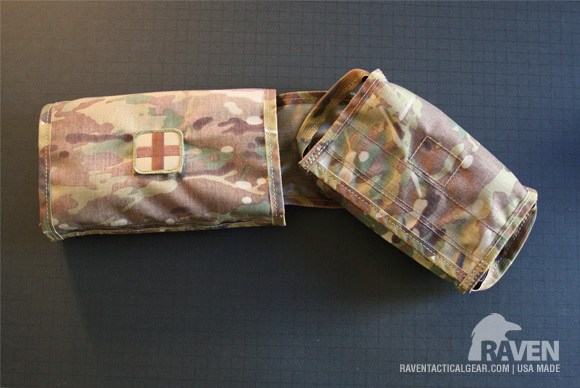 So it will ONLY hold (mainly because of product sizes/cubes) the following items: Quick Clot Combat Gauze LE, Z-Folded; Nasopharyngeal Airway 28fr w/lube; HALO Chest Seals,(1pr) ; Israeli Bandage 4"; H&H Compressed Gauze; Elastic Bandage 3"; Decompression Needle; & Nitrile Gloves (1pr). 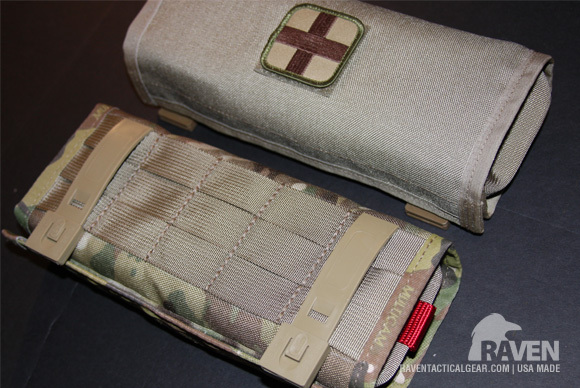 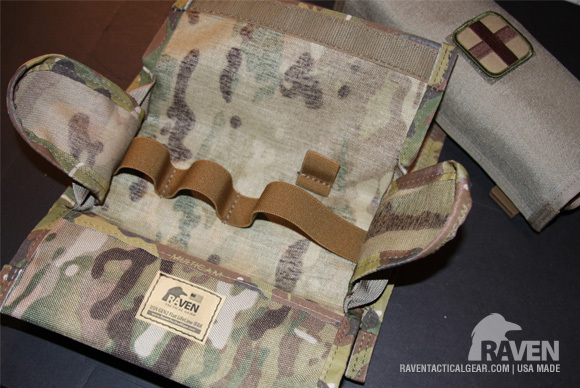 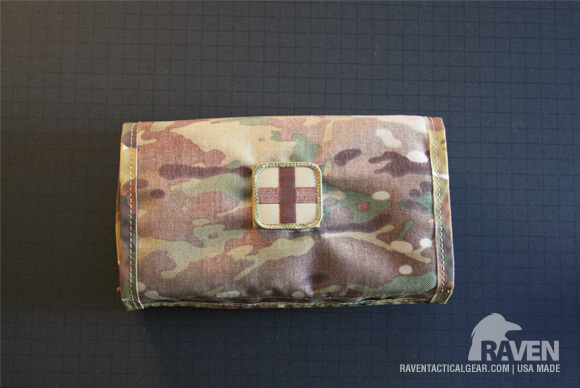 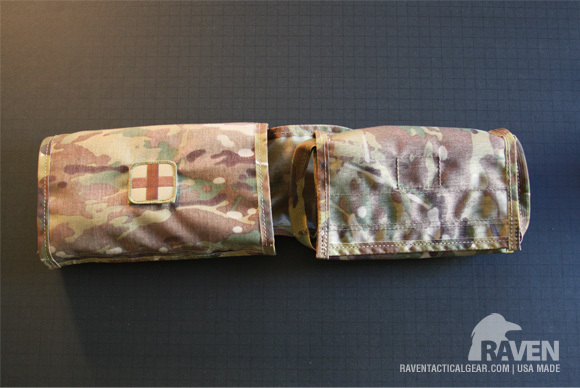 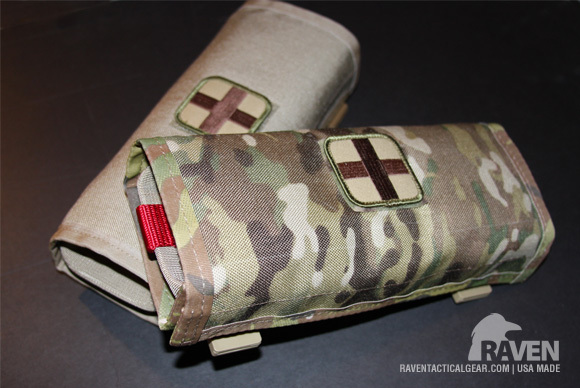 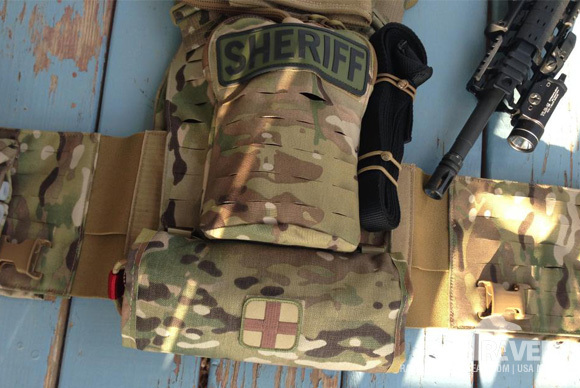 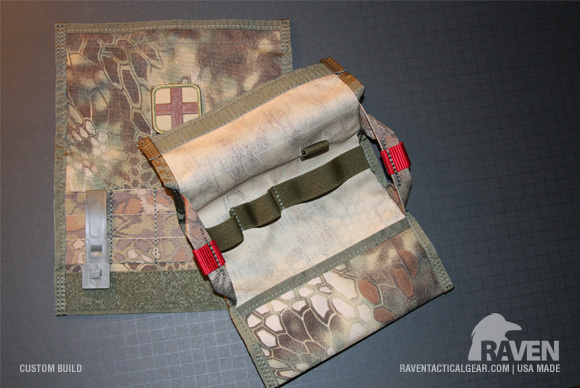 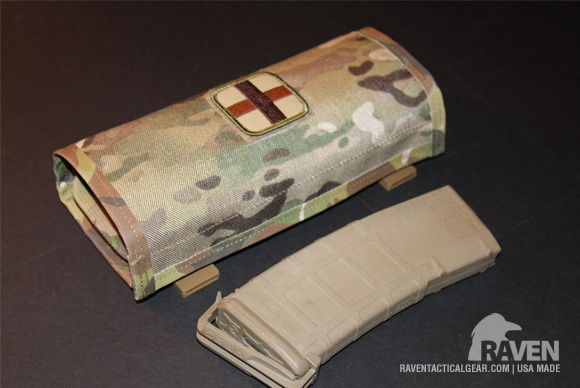 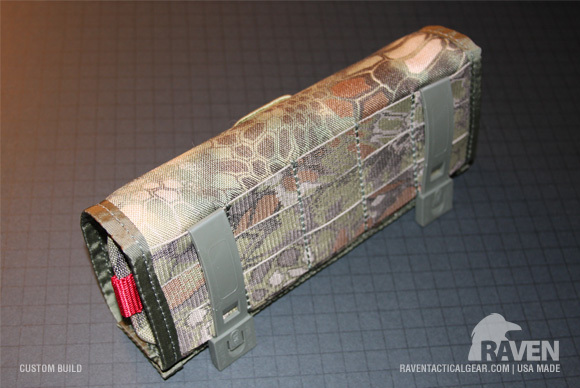 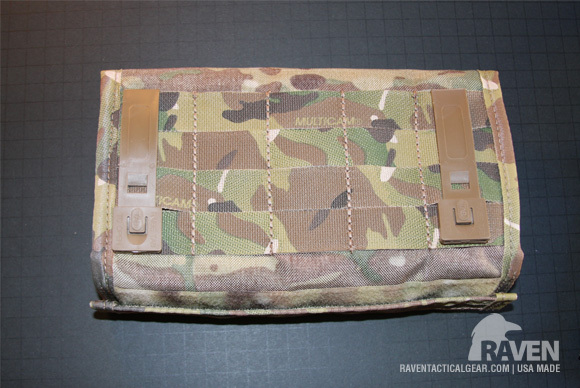 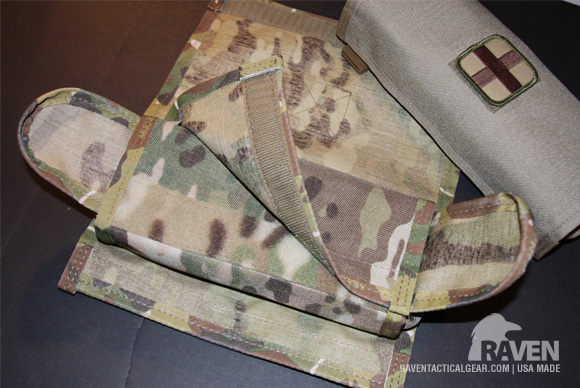 This rapid deploy, rear mounted trauma system, is designed to fit on the back of your Battle Belt or Plate Carrier/Tactical Vest, preserving valuable front-vest real estate for your ammo, weapon systems, etc. Elastic mounting system for Medical supplies (not included) with locations for marker or decompression needle. 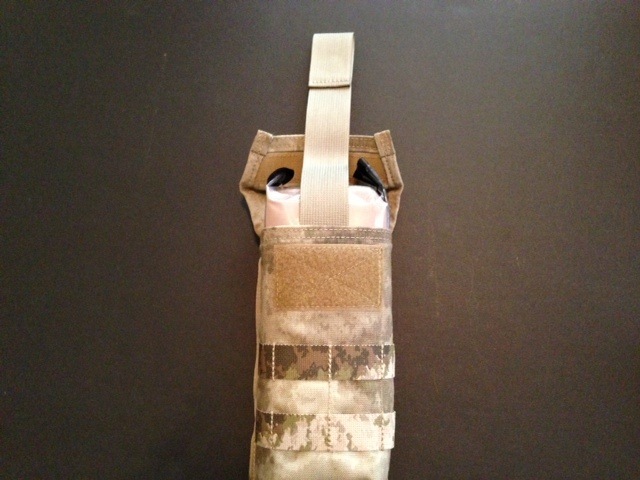 Available in Black, Tan 499, Camo Green483 & Multicam...Other camo patterns please inquire. 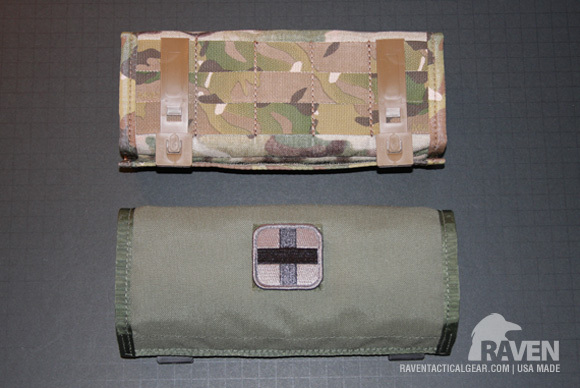 Larger than the USN GEN2 version by 2" in height, it provides more breathing room for your medical supplies. 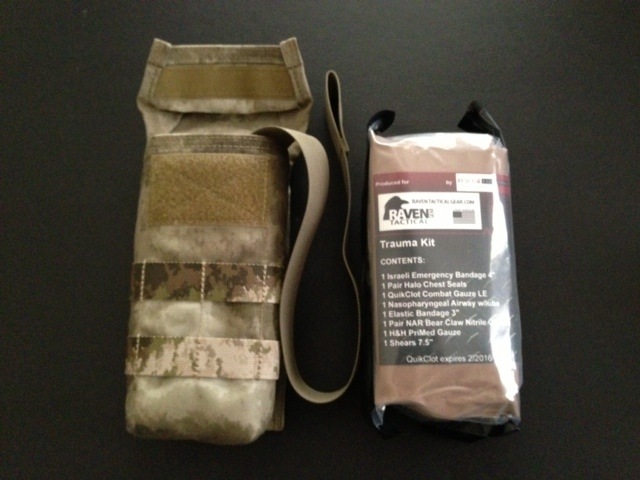 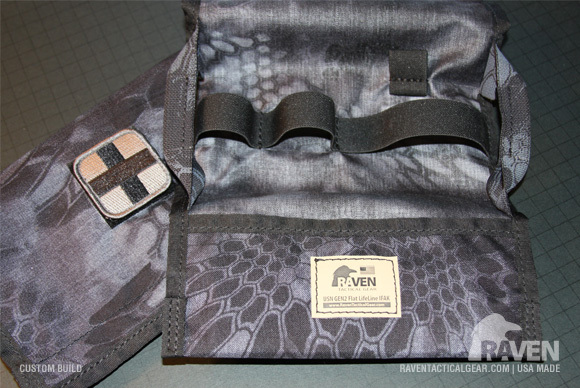 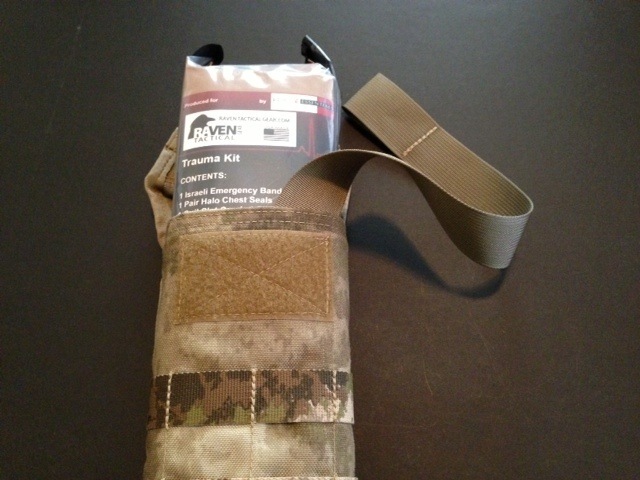 Fits on the back of your Battle Belt or Plate Carrier/Tactical Vest. 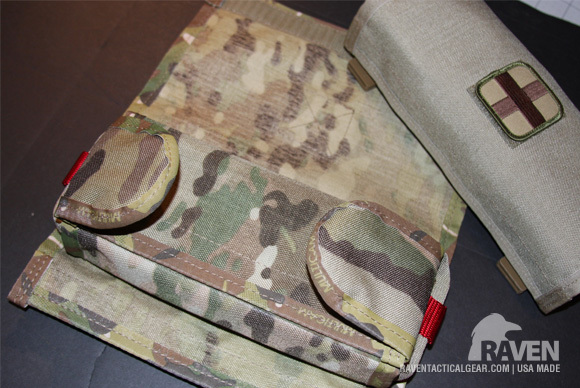 Designed out of the necessity of preserving valuable vest-front real estate as well as desiring a removable, rapid deploy, rear mounted trauma system. 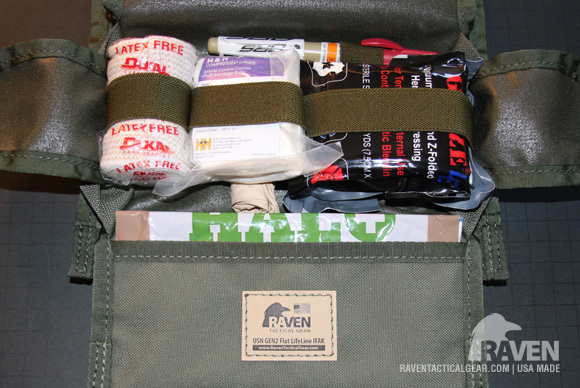 Elastic mounting system for Medical supplies with locations for marker and decompression needle (not included). 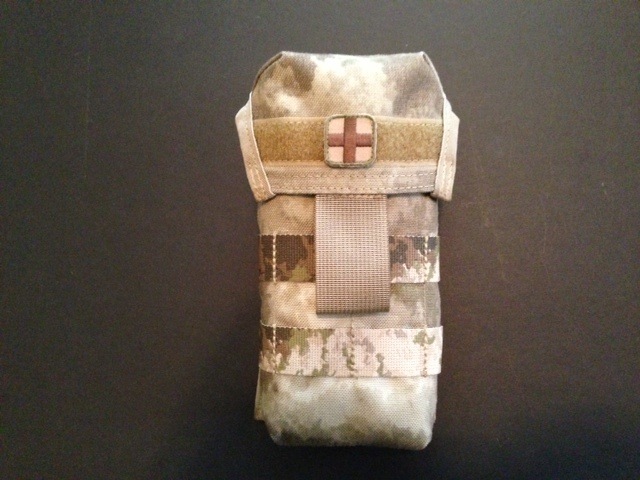 Available in Black, ACU, Tan 499, & Multicam...Other camo patterns please inquire. 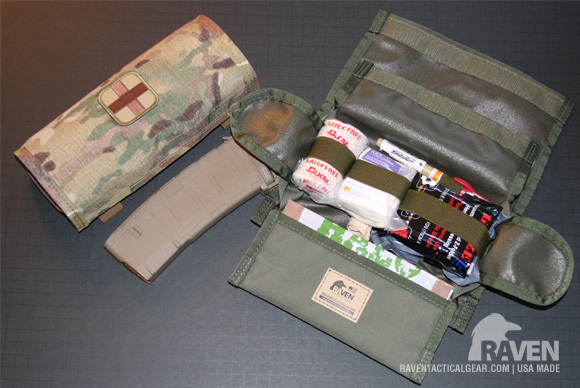 Medical Option: Can be ordered "Loaded" in a sealed pouch with the following items: Quick Clot Combat Gauze LE, Z-Folded, Nasopharyngeal Airway 28fr w/lube, (1pr) HALO Chest Seals, Israeli Bandage 4", H&H Compressed Gauze, Elastic Bandage 3", Nitrile Gloves (1pr), EMT Shears. 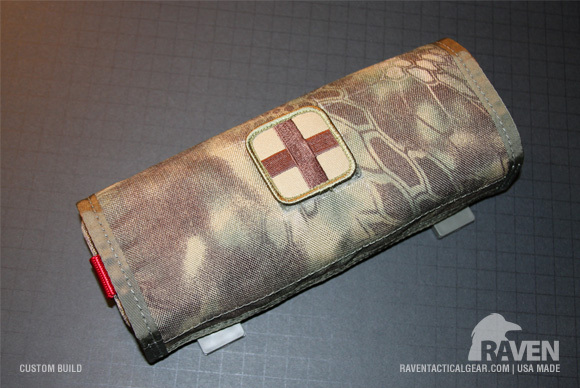 Additional items that can be added: Decompression Needle. 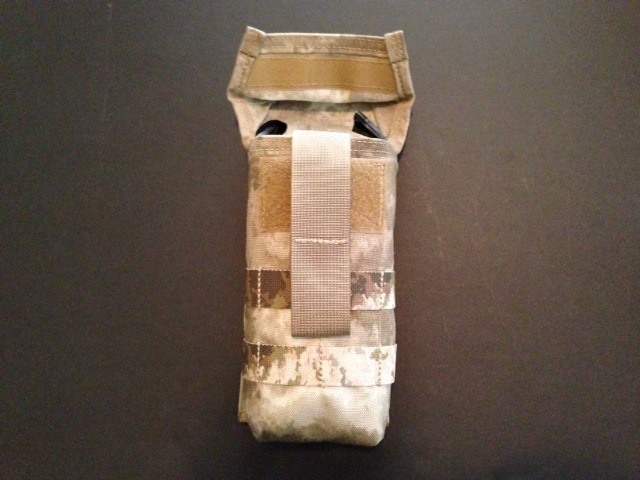 About the same size as a double stack AR Mag Pouch. 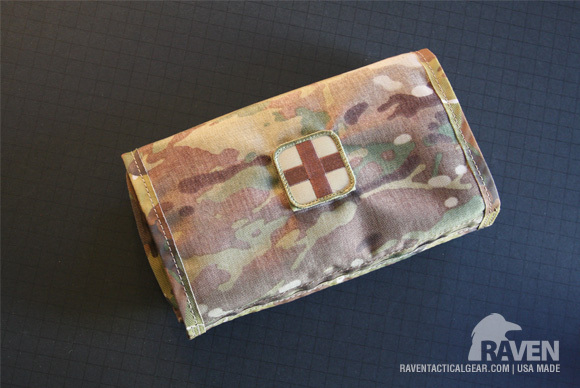 Deploy tab lifts medical supplies up and out. 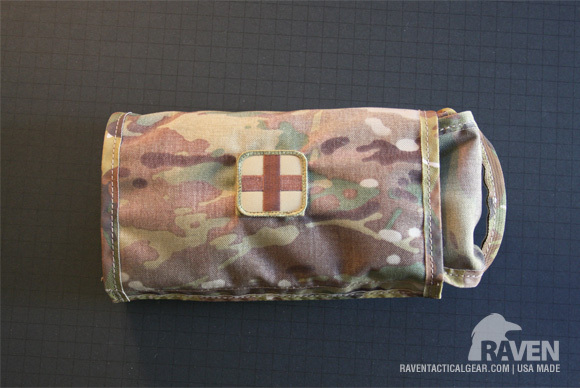 Wrap around cover keeps dirt out with loop fields on front for Medical ID or Blood Type Patches. 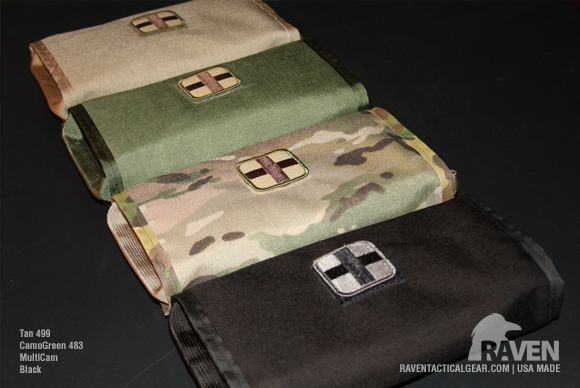 Available in Black, Tan 499, Camo Green 483, & Multicam...Other camo patterns please inquire. 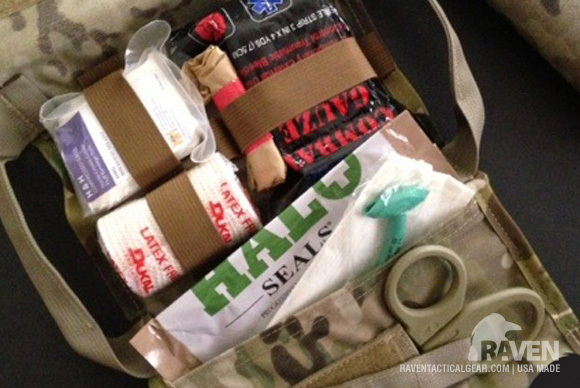 Medical Option: Can be ordered "Loaded" with the following items: Quick Clot Combat Gauze LE, Z-Folded, Nasopharyngeal Airway 28fr w/lube, (1pr) HALO Chest Seals, Israeli Bandage 4", H&H Compressed Gauze, Elastic Bandage 3", Tan Nitrile Gloves (1pr), EMT Shears. 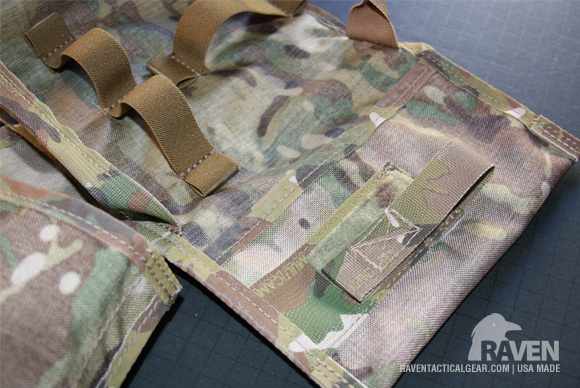 Manufactured from Crye Precision 1000 Denier Cordura Multicam Nylon with a coated back side to help with water repellency. 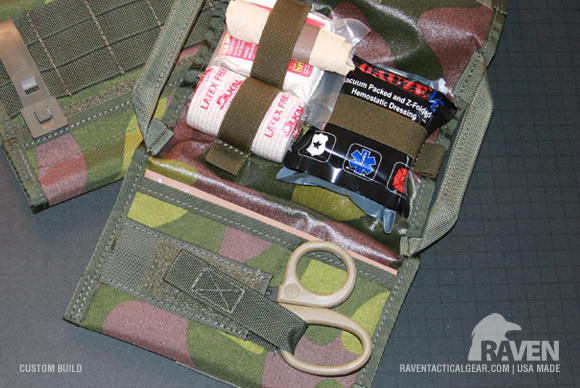 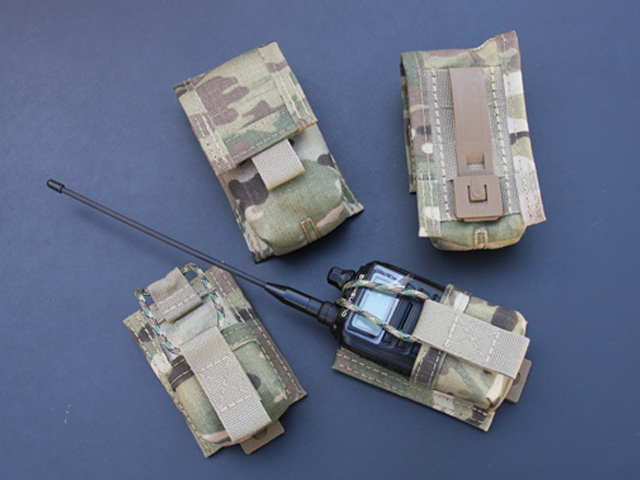 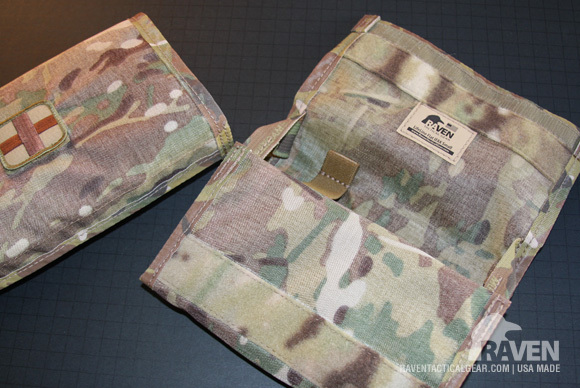 MOLLE/PALS compatible. 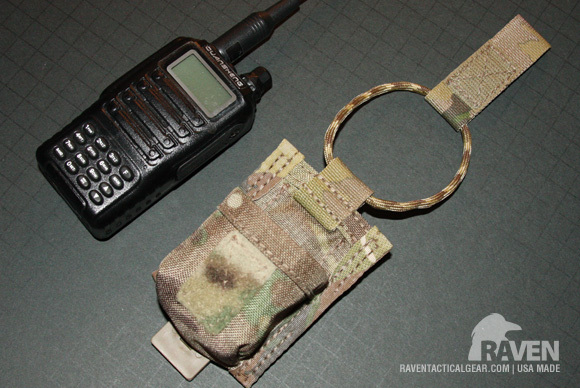 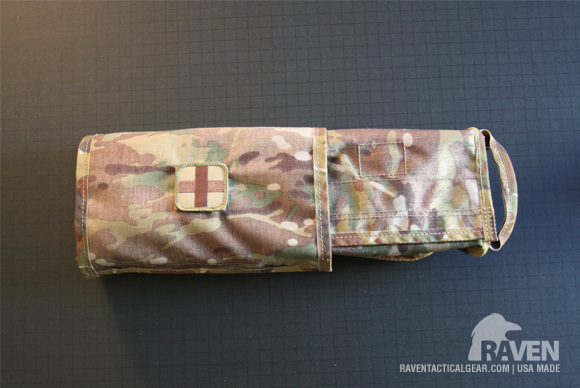 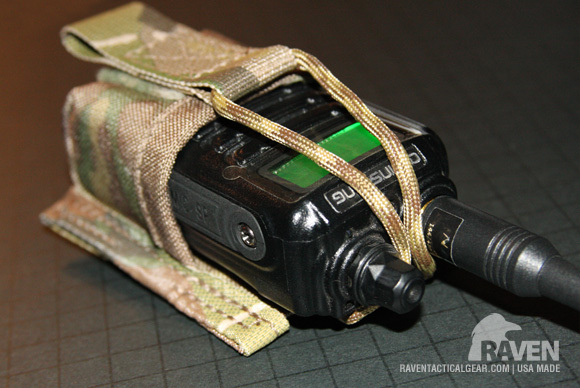 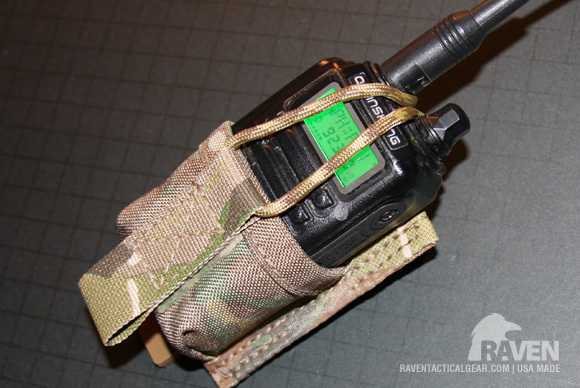 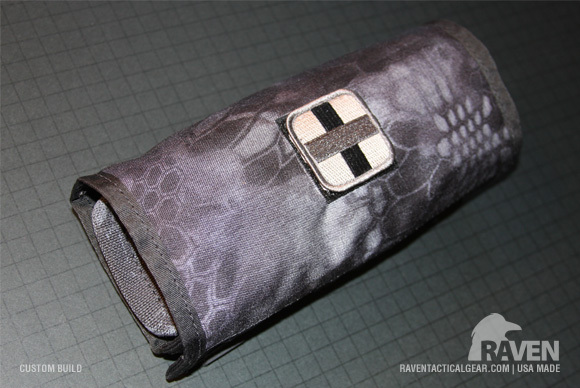 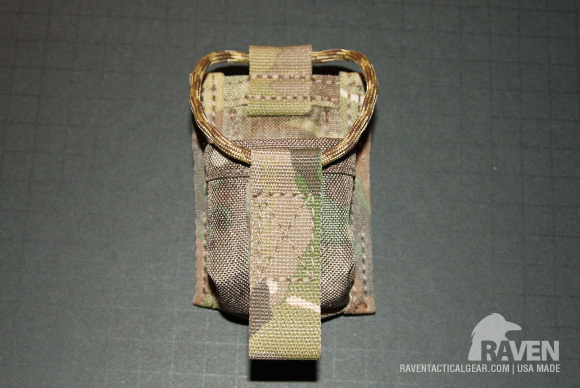 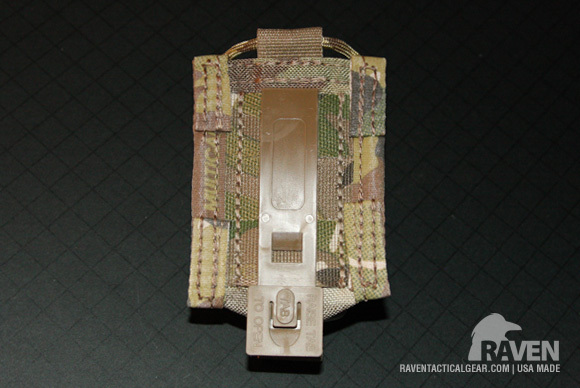 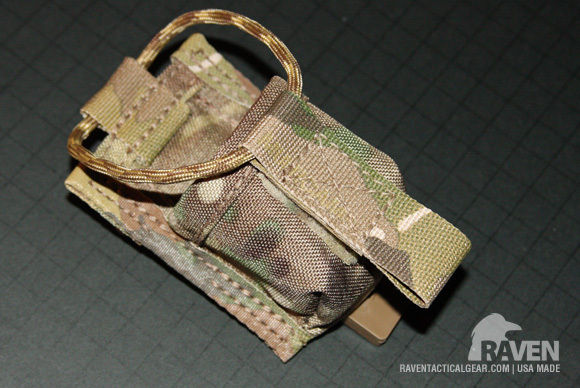 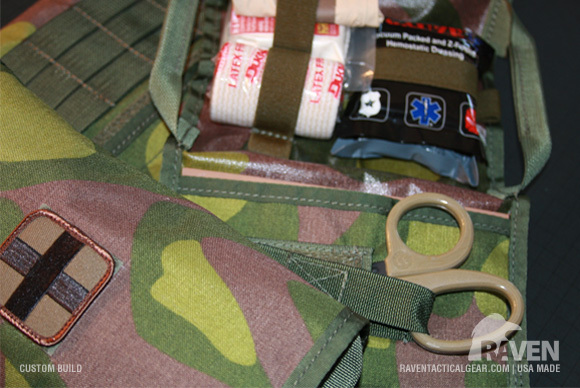 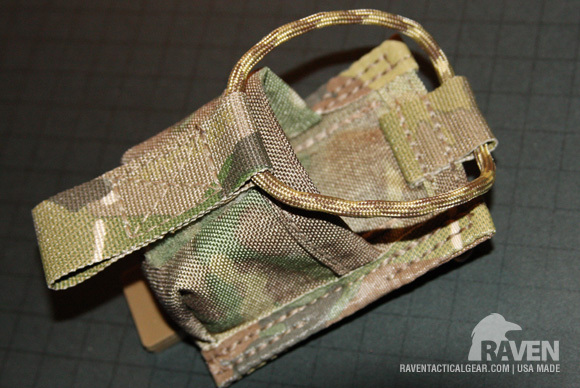 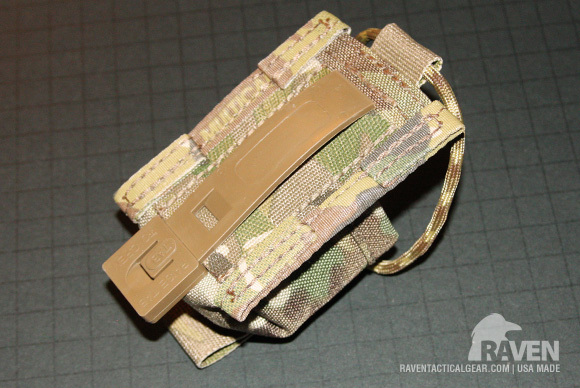 Easy vest attachment via Tactical Tailor Malice Clip. 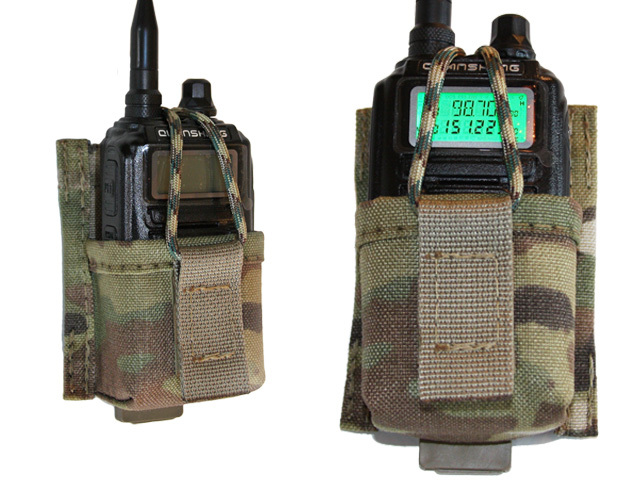 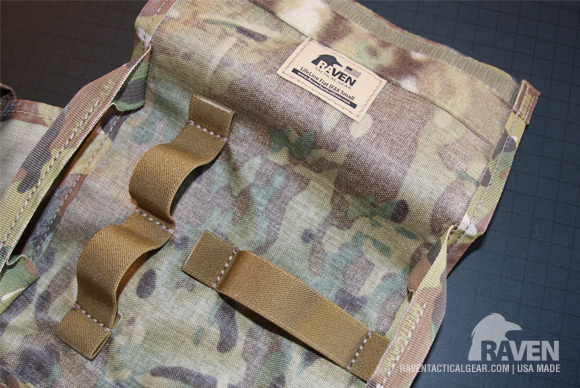 Open Top Style: Features Multicam 550 cord with velcro secure tab for closure. 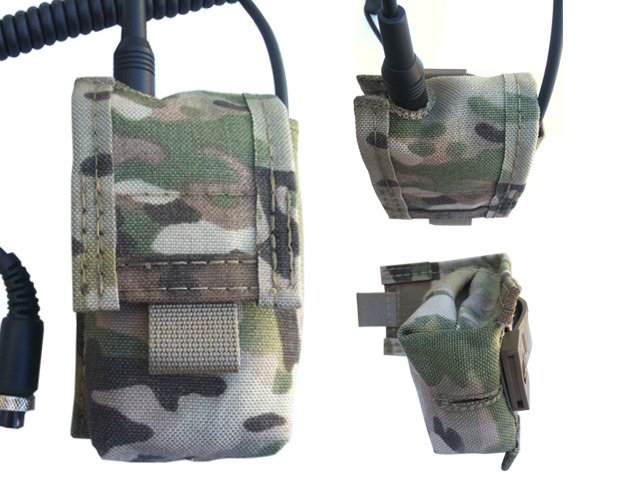 Low side cut leaves ample room for Mic Plug Connector. 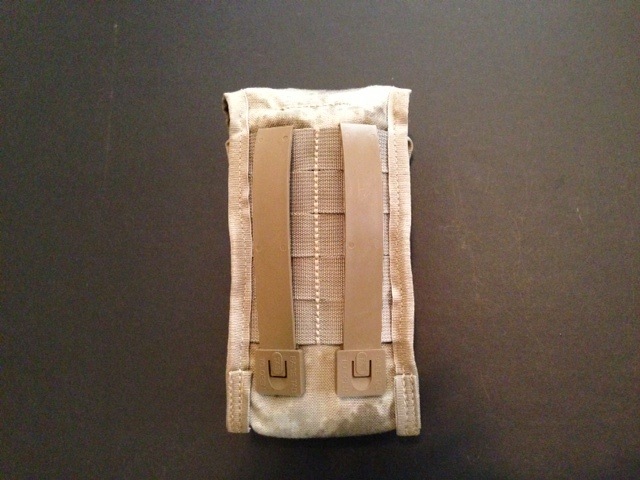 How long does it take to build your products? 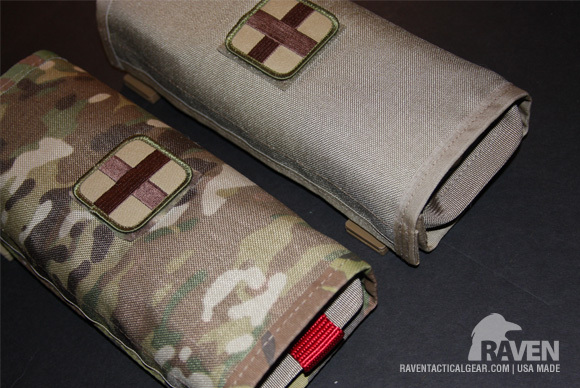 All of our products are high quality, build to order products and will ship within 2 - 3 weeks of order placement.